This map of a portion of the surface of Saturn's moon Titan shows predictions for the areas that will be covered by selected combinations of images anticipated from the camera on the Huygens probe as it descends through Titan's atmosphere on Jan. 14, 2005. The map is made from data acquired by the visual and infrared mapping spectrometer aboard the Cassini orbiter during the orbiter's flyby of Titan in October 2004. Cassini released the Huygens probe in December 2004. The octagons indicate anticipated fields of view of panoramic mosaics of images taken by Huygens' descent imager and spectral radiometer instrument as the probe reaches certain altitudes during its descent. This map shows the footprints for mosaics to be assembled from 36 individual images at each altitude, with the field of view cut off at 75 degrees from straight down although the actual images will extend all the way to the hazy horizon. Each mosaic made this way will be about 1,300 by 1,300 pixels. The largest octagon (in red) is about 1,120 kilometers (696 miles) across and represents the field of view for the mosaic of images taken at an altitude of 150 kilometers (93 miles). From that height, individual pixels in the center of the image will be about 150 meters (492 feet) across, though haze between the ground and the camera at that height will likely degrade the resolution in those images. The progressively smaller octagons are the anticipated fields of view from altitudes of 90 kilometers (60 miles), 50 kilometers (30 miles) and 30 kilometers (19 miles). In all, the camera is expected to acquire panoramic mosaics at a total of 20 different altitudes from 150 kilometers (93 miles) down to about 3 kilometers (2 miles). The pixel size in the mosaic from 3 kilometers high will be about 3 meters (10 feet) across. In addition, the camera is expected to obtain individual images down to an altitude of about 200 meters (656 feet) with pixel size as small as 20 centimeters (8 inches). 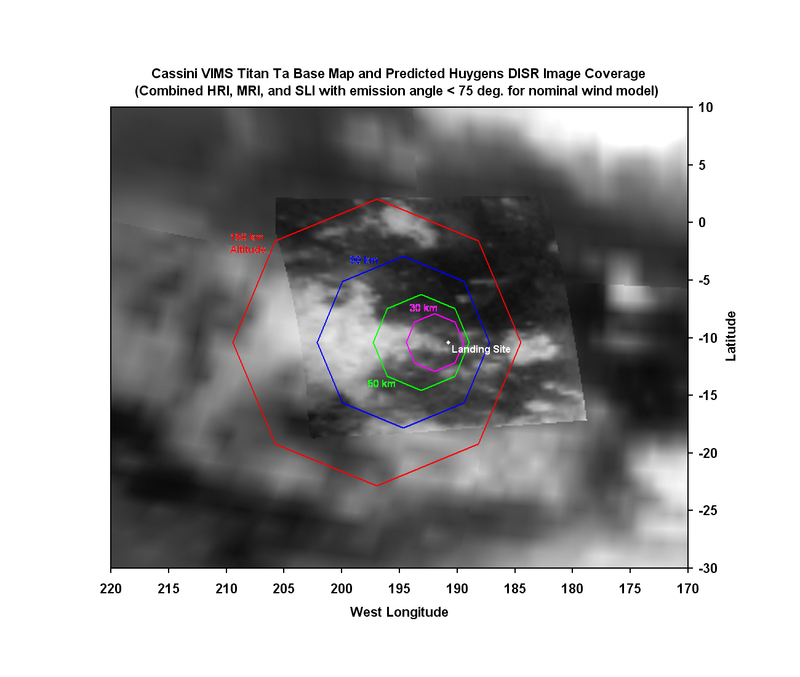 The location of the anticipated landing site is based on modeling of Titan's winds, and the actual landing site will be different if the actual winds experienced by Huygens during descent differ from this model. The Cassini-Huygens mission is a cooperative project of NASA, the European Space Agency and the Italian Space Agency. The Jet Propulsion Laboratory, a division of the California Institute of Technology in Pasadena, manages the Cassini-Huygens mission for NASA's Science Mission Directorate, Washington. The Cassini orbiter and its two onboard cameras were designed, developed and assembled at JPL. The visible and infrared mapping spectrometer team is based at the University of Arizona, Tucson. For more information about the Cassini-Huygens mission visit, http://saturn.jpl.nasa.gov. For more information about the visualand infrared mapping spectrometer visit http://wwwvims.lpl.arizona.edu/.